LOOK NO FURTHER! Incredible POOL Home located in the Lyndan Trail community has over $100K in upgrades. Starting with the pre-paid solar panels for 20 years, Ring door bell, Koi Pond, Smart key technology door locks, upgraded garage door openers with key-less entry and so much more. First floor features a bedroom and full bath near entrance with a large formal dining and living room close by. Relax and enjoy your gourmet kitchen with island featuring granite counters, back splash, loads of storage, large breakfast nook eating area, walk in pantry, Touch 2 O kitchen faucet and double oven. The open concept design flows seamlessly to the family room which offers a cozy fireplace and nice views of the backyard pool area. Upstairs features a loft with built in desk, five large bedrooms, bathroom with dual sinks. Master is oversized with large walk in closet, soaking tub and dual sinks with separate shower. Step outside and entertain your guest in the large pool/spa with full patio cover, koi pond, above ground garden beds, fenced dog run with artificial turf, shed and don't forget to notice the gated RV parking. Plenty of room for all your toys in the DRIVE through four car garage! This home has everything you need and more. 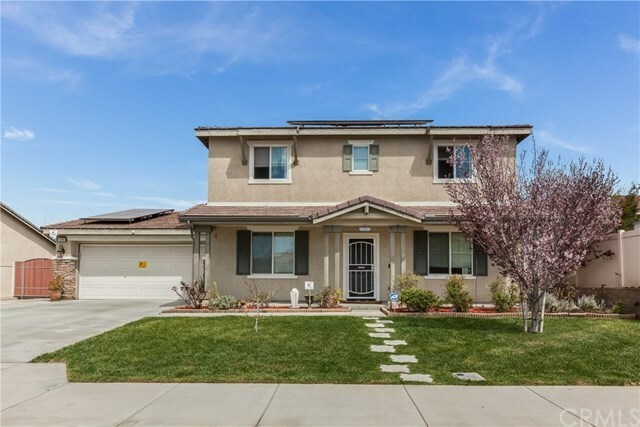 Close to schools, fwy and shopping.